By most counts I am a religion nerd. Not only is it a favorite topic of discussion, but if there is a church, temple, mosque, synagogue, shrine or ritual place of note in the area that allows visitors, I am there. So when I learned that the fourth largest Christian church in the world - the Cathedral of St. John the Divine - was in New York City, I of course had to go. The cathedral itself was grand, Gothic, and a little too dark, but what I most remember is that just outside the building was a sign inviting visitors to stroll in the “Children's Peace Garden.” And in the center of the small garden, dominating the space, was a very large statue of the Archangel Michael, wings unfurled, sword drawn, standing over the prone and nearly decapitated body of Satan, his horned head hanging over the edge of the piece by a single bronze ligament. And I thought in horror, “Who in their right minds would put something this violent in a children's peace garden? Reading the inscription, I understood. For the creators of this garden, peace comes when good annihilates evil. In their theology, there are good people and bad people. If you are a good person, then goodness is inherent and evil is external to you, and if you are a bad person, then evil is inherent in you. Actions are neither inherently good nor evil, people are. So killing an evil person is a good act because it reduces the amount of evil in the world. The ends justify the means. 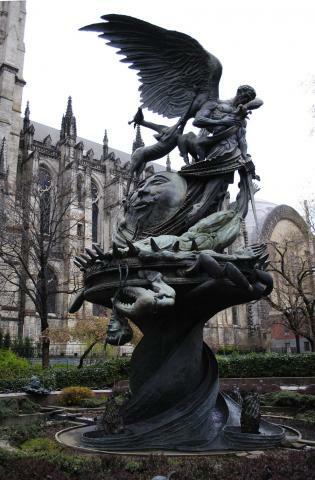 According to that theology, Michael decapitating Satan is the triumph of good over evil. This is the same thinking, regardless of religion, that motivates religious wars and attacks. It's the thinking behind capital punishment. It's the thinking behind most murders, actually, like the many we’ve grieved this month including in Baton Rouge this morning. And if I am honest, it's the same thinking, on a smaller scale, that I revert to when someone has hurt me and my first reaction is to hurt them back. Verbally. When my desire is to say something so devastating that the person is overwhelmed and does not mess with me again. In those moments, I have to stop and remember that from a Buddhist perspective, overcoming evil doesn't work that way. First, as the Heart Sutra says, “All phenomena in their own-being are empty.” No thing including us is inherently in and of itself anything. All things including us are conditional upon other things. (That whole interdependent web of existence.) Thus, people are neither inherently good nor evil. Whatever state we're in is the result of our conditions. Now, emptiness doesn't mean that there is no good and evil. It's not “all relative” and “anything goes.” Rather, the focus is on actions, not people. Those actions that benefit beings are wholesome and can be considered good and those that cause harm to beings are unwholesome and can be considered evil. The focus is on actions, or karma. In common usage, karma is often interchangeable with punishment. Sometimes, punishment and reward. In the original Sanskrit, however, the word “karma” literally means action. Simply put, karma is the consequences of our actions, all consequences of every action. We cannot take any action, good or bad, without it affecting both the wider world AND ourselves. From a Buddhist perspective, even an angel of God such as Michael cannot kill someone, even the Devil himself, without that act of violence tainting their own being, making them more inclined to violence in the future. Because of karma, the means are the ends. Thus, we cannot end evil through violence, because violence itself increases the evil in the world. 1. Wednesday evening I attended the second in a three-week course on Process Theology at UUSF, taught by Rev John Buehrens. At one point, Rev. Buehrens explained how Alfred Whitehead felt that Western philosophy with its emphasis on "Truth" had veered too intellectual, and thus Whitehead tried to bring us back by focusing on aesthetics, our sense of awe in response to encountering Beauty. The thing that engenders humilty and recognition that there is something bigger than us. 2. Years ago I was talking with a young man sitting next to me on an airplane, and he said that nothing human-made was beautiful, that he only recognized beauty in "natural" things. I asked him whether he'd ever seen the view of Los Angeles (which we were flying into) at night from the top of Mulholland Drive. He repeated more adamantly that nothing human-made could ever be beautiful. And I wondered how strong one's ideology had to be in order to not see beauty in the view from Mulholland Drive at night. You can't get more human-made than a missile. All metal and electronics and explosives, its very purpose is ugly, to kill. If you asked me before I saw this video whether a missile could ever be beautiful, I probably would have said 'No.' Yet here is this mesmerizingly beautiful video. (Which is not to say that it might not also have created some real ugliness at the same time.) And I am watching the video via a laptop connected to the internet. More human-made metal, plastic, and electronics. And it's still beautiful. One of the main points that I see in process theology (or process thought) is that humans are not separate from the rest of existence. We are part of the interdependent web, impacting it and being impacted by it, no different than any other part. Together - all the parts of the web together - we co-create reality. So if nature creates beauty, then how can humans who are an integral part of nature not also create beauty? (And ugliness and everything in between.) To claim otherwise is to set humans apart from nature. It's to claim a special, exalted place, even if we claim that all we do is ugly and harmful. Ironically, true humility recognizes both the "good" and "bad", both the beauty and the ugliness. The last time I was in DC, my friend Michael Roehm observed to me that UUs spend a lot of time talking about interdependency, but we don't spend much time thinking about emptiness (both are concepts in Buddhism, and related to each other, kinda like infinity and zero). I have been reminded repeatedly of the truth of his words ever since then, including today. This afternoon I was listening to NPR about the disproportionate expulsions of Black and Latino students from schools, and the (misguided) reasoning behind it being that if you remove the "bad" kids, that will make it easier for the "good" kids to learn. (The article used those words, "bad" and "good," so I am using them too.) Obviously racism is the primary driving force; how else to explain why black and brown students are thought of as "bad" for committing the same kind of infractions as white students. But in along side the racism is this belief that people are inherently something. Inherently good. Inherently bad... Our social policies are based on this belief. Hence, we focus on getting rid of the "bad" people, whether by expelling students or locking up prisoners with no attempt at rehabilitation. (And we let "good" people off the hook with no accountability even when they do decidedly bad things, because, well, they are inherently "good" so the fact that they did something bad was just a temporary glitch, an exceptional circumstance.) If, instead of thinking of people as inherently "good" or "bad," we focused on emptiness, then we'd see that people reflect back what they experience. In that case, our social policy would change from that of trying to separate out and eliminate the "bad" to that of trying to create the conditions and causes that lead people to behave in more beneficial ways. Like Adam, I am lucky enough to be able to attend the Convocation on Theology of Justice and Ministry currently being held just outside of Baltimore. It is late Wednesday night, almost Thursday morning, but I am just posting about Tuesday because it’s taking me that long to digest the rich diet of ideas being offered. We started the Convocation by devoting the first session to our UU theological and historical background in social justice – our religious grounding. We heard from three provocative panelists – Rebbecca Parker, Dan McKannan, and Jill Schwendemn. One theme that emerged was to recognize the rich history that we have coming out of two liberal Christian traditions – the Unitarians and the Universalists, and the importance to ritual to reaffirm our values. This being a UU convocation, those of us in the audience were asked to engage in these questions for ourselves – to think about how our own faith impacts our social justice work. I thought about how both the Christian tradition of the culture in which I grew up and the Buddhist tradition of my ancestral culture were equally important to me. The Judeo-Christian stories are so familiar and emotionally powerful. Yet at the same time, I do not want those traditions to be privileged over others such as Buddhism and Hinduism. The need to recognize the religious pluralism within our UU congregations mirrors the need to recognize and celebrate diversity in all its forms in our society. The second session took up the problem of suffering, brokenness, and evil in the world, and our appropriate response. If the earlier session celebrated our UU and American heritage, then the evening’s panelists – Taquiena Boston, Victoria Safford, and Sharon Welch – all gave beautiful, painful testimonies as to where we have been unable to fully address the challenges that arise in an imperfect world. The room struggled with the concept of evil and wondered whether it was necessary to confess complicity by making the statement “I am evil.” Dr. Welch stressed a non-dualistic approach, recognizing and addressing acts of oppression while at the same time not labeling others as “evil” in a way that evokes animosity towards them and thus perpetuates the cycle. And Rev. Safford talked about how the choices that we make to no longer do harm are not one-time events. The choice must be made over and over again. What I understood from her was that we have been conditioned to be inclined to make the choices that we make. That doesn’t absolve us of responsibility for our choices but it recognizes that simply choosing once would not be enough. As I listened to the conversations from both the afternoon and evening – discussions of “sin” and the means to “reconciliation” – I felt that it would be helpful if we UUs became conversant in other faith traditions – if we truly understood the concept of karma. I do not mean the Westernized understanding of karma as a punishment and reward system. That comes from imposing the concepts of “good” and “evil” and a “divine judge” on an Eastern concept. Karma is not based on judgment. It is merely the consequences of one’s actions. Harmful acts have harmful consequences. Understanding this allows us to name and admit to oppressive acts without the debilitating judgment of “evil doer.” It tells us that the need to choose to end oppression is urgent for every moment that we allow it to continue (which is a choice), we generate more bad karma, the consequences of our actions (or inaction). What’s more karma reminds us that even when we choose the loving act, our work is not done. We will have to choose over and over again because the consequences of past harmful choices are still with us. It reminds us that there are no easy fixes to repair the world and build Beloved Community. But it also follows that if we act in love, steadily, that reconciliation and wholeness are inevitable. An interesting discussion came up on one of the online discussion forums. Someone posted the results of an fMRI study where researchers found patterns of brain activity that predict people's decisions up to 10 seconds before they're aware they've made a choice. The poster then asked the question whether this was the end of the belief in free will. The study itself does prove there's no free will. But it does highlight how disassociated our "consciousnesses" are. We perceive ourselves as an integrated whole when in reality, different parts of the brain attend to different things. We are, as Buddhism teaches us, collections of aggregates. But even tho this study doesn't disprove free will, if one understands the nature of science, one understands that there is no room for the concept of free will within science, just as there is no room for the concept of God. Let's be clear here. This isn't to say that science says there is no God/free will. Science doesn't say anything about either; it can't by its very nature. And so, even if/when in the future neuroscientists map out our entire complex brains and find predictive correlations between neural activity patterns and what we perceive as our "decisions," even when science gets to the point where it says it can explain "choice," there will be no room for free will in there. Any scientific explanation of "choice" has to be a reductionist, materialist explanation. The only reason why we can hold onto the illusion of free will is because the decision making process is as of yet unexplained. When it is explained, it will be in terms of synaptic weights and stimulus strengths - wiring, environment, and chance. It was this realization that caused me to leave science. Not because I was disillusioned - I still love science - but because I realized that I most wanted was not to be found there. I want meaning, which for me necessitates free will. I need to believe that I have a choice (even if highly constrained) and that my choices matter. My theology is that God and creation work together in partnership to co-create creation. (I am that I am. I am becoming that I am becoming.) In my theology, which is a process theology, free will is that which allows co-creation by us having the ability to choose differently. To create the new, the surprise. Without it, there is no "creation." Just... randomness constrained by patterns playing itself out. What's more, I can't make sense of ethics/morality without a concept of free will. What does it mean for someone's actions to be moral or immoral if there is no choice? What would it mean to try to cultivate moral character as Aristotle encouraged us to do? Ethics and morality are based on the assumption that we have a choice in the actions we take. There is no point in delineating what is a moral action and what is an immoral action if, in the end, we have no choice in what we do anyway.